Burnley’s new record signing is set to play a major role in Ireland’s challenge for a place at the 2018 World Cup, says Niall Quinn. 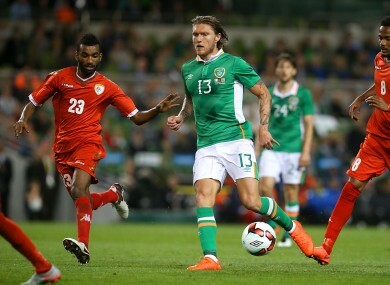 Hendrick playing against Oman at the Aviva Stadium on Wednesday night. NIALL QUINN HAS backed Jeff Hendrick to be a key player for Ireland heading into their latest two-year qualification cycle. The Road to Russia 2018 kicks off with a tricky trip to Belgrade to face Serbia on Monday evening, while Wales, Austria, Georgia and Moldova make up what is a difficult Group D.
24-year-old Hendrick exceeded expectations with his fearless performances at Euro 2016, and the midfielder was rewarded with a Deadline Day move to Premier League newcomers Burnley, who shelled out a club record £10.5 million (€12.4m) to bring him to Turf Moor. “His performances at the Euros woke everyone up to how good he can be,” said former Ireland striker turned Sky Sports pundit Quinn. “It’s Burnley who went the furthest mile to break their record and bring him in. “He’s on an upward curve and is a player who could go anywhere really in terms what his performance levels could be like now. He has started to understand in the summer that he could play on the same stage as great players who get all the accolades around Europe. “While they’ve had to dig deep by their standards to bring him in, Burnley have got themselves a player who could be anything. If he keeps believing in himself, I think he’s got a hell of a career ahead of him. “John O’Shea scored the most important goal in the group next to (Shane) Long’s against Germany. O’Shea made that worthwhile by getting his last minute goal against Germany and it wouldn’t have happened without Hendrick. He took it on himself, read the situation, understood the trouble we were in and found himself at the far post to produce the most amazing cutback. “Only players with brilliant intelligence can do things like this. Other players look at the cross from deep and think ‘why did he kick it up in the air there’. One area Hendrick could improve on is his goalscoring as the Dubliner has yet to find the back of the net in 26 senior appearances for the Boys in Green — although he has come agonisingly close on several occasions. Quinn isn’t worried in that regard and believes he will get off the mark sooner rather than later. “It’s a matter of time,” he added. “I’ve seen him involved in a number of goals and he’s got tonnes of time. It’s not as if he’s got number nine on his back and Ireland paid a hundred million for him. “Goals will come, but what he needs to do in terms of the impact he has in games, is to continue to be strong — be a real handful in midfield with his strength combined with an ability to play, his reading of the game and his intelligence. “There’s no doubt about it, particularly in the summer, I think he was the most surprising good news story of the Irish team. “You knew (Robbie) Brady had this great skill, you knew what (Shane) Long and players like that could bring to the table but very few of us foresaw Hendrick stepping up to the plate the way he did at the Euros. Quinn sees Monday’s meeting with Serbia as potentially the most difficult away fixture of the campaign and says coming away from the Red Star Stadium with one point would be a decent result. “This is actually the key game and it comes on the first day. To keep the whole thing going, a draw is fine. I wouldn’t argue with a draw at all there. “I think it’s going to be the toughest place to go for a lot of teams so. I’m not saying we should go out and play for a draw, but I wouldn’t be disappointed with a draw. Sky Sports will show Serbia v Republic of Ireland on Monday night, as part of over 200 live FIFA 2018 World Cup qualifiers on Sky. Sky TV customers can upgrade to Sky Sports for just €20 per month via the red button. Email “'Jeff can be anything. He's got a hell of a career ahead of him'”. Feedback on “'Jeff can be anything. He's got a hell of a career ahead of him'”.